There’s been a coup d’état. It was not a mob of AK-47 wielding militia overthrowing a dictator in a third-world country. This one was different. On April 2, 2009 at a meeting of the G-20 in London, the fiscal autonomy of the United States (and other nations) was quietly turned over to a little known bank with a troubling Nazi past. 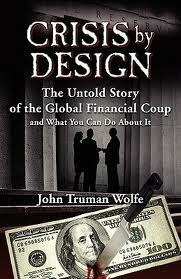 The story of this coup sounds like something out a Ludlum novel, but this is real and John Truman Wolfe has documented one of the most enormous power grabs in history, the establishment of what international bankers call a GMA, a Global Monetary Authority. How it was done, who did it, and why, is the subject of Crisis by Design The Untold Story of the Global Financial Coup, a no-holds-barred expose of a takeover of the planet’s central banks. Wolfe not only exposes the dark side of this operation, he tells you how you can protect yourself as well as what public policy actions need to occur to take back control of our national economic life. Wolfe does not spew economic psychobabble. Instead, he writes in a smooth and easy-to-understand style. And the message in clear-an international financial coup has occurred. We must protect ourselves as well as our national sovereignty. Wolfe has just added two chapters covering the European Financial Crisis and what it means for the U.S.
John Truman Wolfe is the creator and author of the award-winning Tom McKenna private eye series. His latest release—Crisis By Design: The Untold Story of the Global Financial Coup and What You Can Do About It, exposing the real forces behind global financial crisis, has become an Amazon Best Seller. He has been a frequent guest on American radio and television including Fox TV. He has given seminars to some of Russia’s leading bankers, and government officials. Just prior to publication of Crisis by Design, Chinese government officials flew him to Beijing to consult with them on the causes and solutions to the global financial crisis. He spent several days in Beijing discussing the information revealed in Crisis by Design with these parties as well as doing media interviews for Chinese Television. John Truman Wolfe is the pen name of Bruce Wiseman, who lives with his wife Barbara and their 130 pound Akita, Sensei, in Los Angeles.